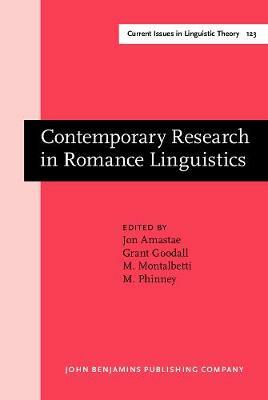 This volume contains 23 papers selected from those presented at the 22nd Linguistic Symposium on Romance Languages. The papers address issues in phonology, morphology, syntax/semantics from contemporary theoretical perspectives. In addition, in keeping with the symposium's US-Mexico location and commemoration of the twin quincentenaries of Columbus' first voyage and the publication of Nebrija's grammar, several papers focus on the history of linguistic theory, language contact, variation, and change.